Consider pressing ‘One’ button to come up with an almost human drawn-like, efficient, best bang for the buck, compatibility checked, optimal gaming build for any particular price point. Too good to be true? Well, we are bringing that functionality set to you now, here on Wccftech. 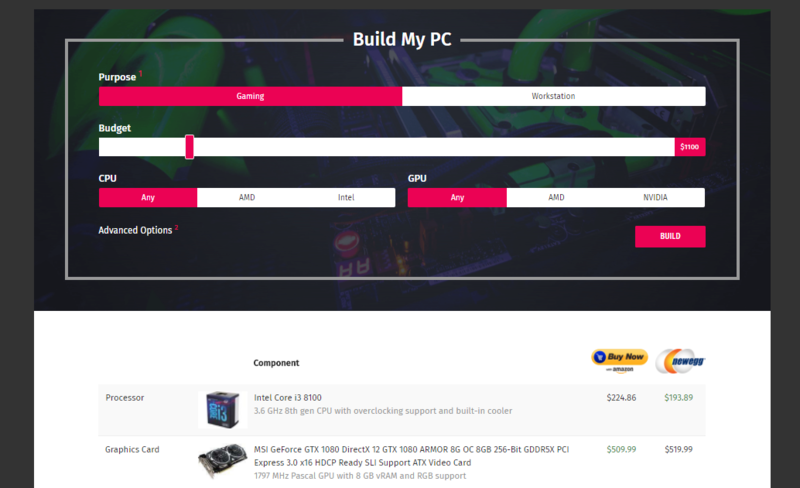 I am very pleased to introduce the public beta of PC Builder. A computer logic based tool to help you make the best component buying decisions possible. The logic currently uses a target specification of 4K60 and will try to give you the best possible build combination for any particular price point. It is designed to automatically check for all known compatibility issues. The tool is currently in the public beta stage and we encourage you to submit any bugs that you may spot using Wccftech’s Tip feature. If you want a workstation build, click on the workstation option to get a CPU-preferred build order. We have also added alternative suggestions for GPU and motherboard vendors in case you do not want to go with the default preference. In addition to that, you can of course, force an AMD only and/or Intel and/or NVIDIA only build. Our performance indicators will show you any performance gains/losses, should you opt for a GPU different from that chosen by the Build My PC tool. The tool will always give you the lowest possible price from all available vendors (currently; Amazon and Newegg). The tool, algorithm and logic behind it were developed after many weeks of sleepless nights by Sohail and Usman.